Mar. 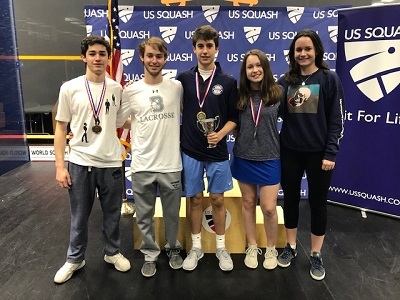 20, 2019: This past weekend, six Bronxville junior squash players traveled to Charlottesville, Virginia, to participate in the U.S. Squash Junior Championship held at the McArthur Squash Center. These players are Tyler Mackesy (Boys Under 19), McKenna Stoltz and Julia Curran (Girls Under 19), Conner Stoltz and Coulter Mackesy (Boys Under 17), and Molly Stoltz (Girls Under 17). 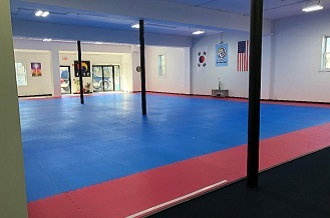 In order to qualify, each achieved national rankings in the top thirty-two positions of their age group. All of these players train at the Bronxville Field Club under Supreet Singh, director of squash, and his team as well as at other clubs. Coulter Mackesy, Tyler Mackesy, Conner Stoltz, Molly Stoltz, and McKenna Stoltz. Not pictured: Julia Curran. 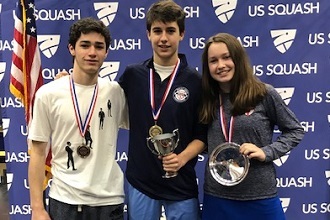 Conner Stoltz had the strongest performance of the weekend, winning the Boys Under 17 Division and becoming the #1 under 17 squash player in the country. This win tops off a very successful squash season for Conner. Molly Stoltz had the second-strongest performance of the tournament, placing #2 in the Girls Under 17 Division. This is particularly impressive, given that Stoltz has another year to play in the Under 17s. Coulter Mackesy finished #3 in the Boys under 17 Division. Mackesy came into the tournament as the #7 seed and upset the #2 seed, Jacob Bulbulia of Short Hills, New Jersey, on his way to the semifinals. Mackesy fell to Conner Stoltz in the semis but ultimately finished #3. McKenna Stoltz and Julia Curran. Julia Curran finished in the top 24 of the Girls Under 19 Division and Tyler Mackesy and McKenna Stoltz both finished in the top 32 of their Under 19 Divisions. 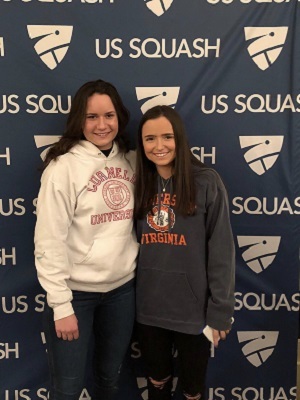 Three of these players will be playing collegiate squash next year: Tyler Mackesy and Julia Curran at the University of Virginia and McKenna Stoltz at Cornell. Congrats to all the players on making it to nationals and playing at such a high level. Pictured at top: Coulter Mackesy, Conner Stoltz, and Molly Stoltz.